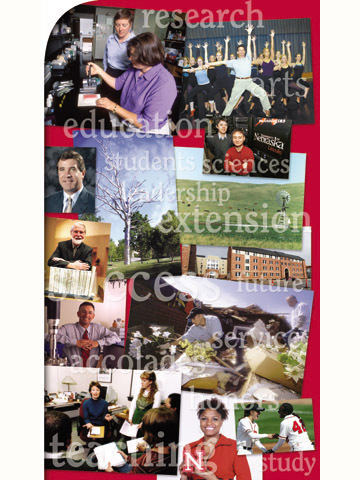 I'm pleased to offer to the campus community and to our friends and supporters this special edition of the UNL Scarlet that highlights and summarizes just a few of our major accomplishments at the University of Nebraska-Lincoln in Academic Year 2003-2004. The College of Education and Human Sciences completed its first full year in 2003-04. After being approved by the NU Board of Regents in June 2003, the new college brought together programs, students, faculties and staffs of Teachers College and the College of Human Resources and Family Sciences. Teaching Faculty & Program Successes - Grant funds Fosse study, leads to D.C. The UNL Dance Division received a National College Choreography Initiative award from the National Endowment for the Arts to support the guest residency of Bill Hastings last year to restage the work of three musicals by the legendary Bob Fosse. The week after the Lancaster County town of Hallam was leveled by a tornado in May, UNL employees pitched in to help. UNL's Biological Process Development Facility is able to develop and test processes to create vaccines and drugs pure enough to be tested on humans. UNL's facility, directed by chemical engineer Mike Meagher, is one of the few based at universities with this specialized ability and as such, the lab has landed several significant projects. Continued development and installation of the SAFER wall barrier at racetracks across the nation, combined with numerous awards and honors for the Midwest Roadside Safety Facility, dominated UNL national news in 2003-04. Chemist Xiao Zeng's discovery that silicon nanostructures appear to behave like metals, and thus lose their semiconducting properties, has earned him a prestigious honor. In April, Zeng received a John Simon Guggenheim Memorial Foundation Fellowship. He was one of 185 fellows named from more than 3,200 applicants. Tests developed by UNL food toxicologists that detect hidden allergens in foods are being developed commercially by the Neogen Corp. of Lansing, Mich.
Two UNL scientists were part of a research team awarded the 2004 International Meat Secretariat Prize for Meat Science and Technology for its beef muscle profiling research. A UNL agribusiness professor received a national award to add to his nearly 30 other honors in recognition of his outstanding teaching skills. The interplay between teaching theory and hands-on education in the classroom is a prime area of interest and practice for Joy Ritchie, professor of English and director of the women's studies program at UNL. For Lewis and Clark buffs, UNL provides a host of publications, events and experts. The expedition's bicentennial has put UNL in the spotlight in the journey's commemoration. In 2004 Paul Savory, associate professor of industrial management and systems engineering, became the newest inductee of the university's Academy of Distinguished Teachers. The Nebraska Lectures: Chancellor's Distinguished Lecture Series was revived in 2003-04. The series recognizes UNL faculty who have made significant scientific and scholarly contributions. The new Department of Statistics was formed in 2003 from the statistics division of the Department of Mathematics and Statistics and the Department of Biometry in the Institute of Agriculture and Natural Resources. September 2003 marked the 20th anniversary of UNL's Food Processing Center, which assists food companies with new product development, market research and other services. A company headed by a UNL professor helped crack the genetic history of the Washington state cow found to be infected with "mad cow disease," or bovine spongiform encephalopathy, in December 2003. The West Central Research and Extension Center celebrated its centennial in 2004. The first and oldest of NU's "experiment stations," it was founded in North Platte in 1904 as an agricultural substation under legislation passed in Nebraska in 1903. The law mandated a facility be built to study the adaptability of dry regions of Nebraska for agriculture, horticulture and forestry. The substation's first irrigation well was dug in 1903, and since then, water science research at the center has grown. In 1904, the first beef cattle and swine experiments were conducted. Nebraska Education Television broadcast its first digital, high-definition, wide-screen program, "WideScreen Nebraska," in December 2003. The show featured spring and summer scenes from across Nebraska set to music by the UNL School of Music. UNL sociologists Lynn White and Julia McQuillan and researchers from four other institutions are studying the social and family implications of infertility and its treatment. The group won a $2.5 million grant in March from the National Institutes of Health for a five-year study. UNL scientists are conducting basic research on Francisella tularensis, the bacterium that causes the lethal disease tularemia. Little is known about the bacterium, but because it causes disease through inhalation, it is seen as a high-priority bioterror threat. UNL research includes studies of F. tularensis subspecies and how they cause disease and studies of specific proteins in the bacterium that may be candidates for vaccines or therapeutic agents. National, international and local water law experts playing to a packed house made UNL's first water law, policy and science conference a major success. Ground was broken in March for a significant expansion of the research feedlot facility at the Panhandle Research and Extension Center in Scottsbluff. The expansion positions the UNL Panhandle Feedlot Research Program as the premier provider of feedlot cattle research and allows UNL to educate and train personnel for the industry through internships and training of graduate students. The $510,000 project was funded by the beef industry, including ranchers and feedlot owners, pharmaceutical and feed companies, local banks and individuals. Nebraska's Sandhills, an uncommon ecosystem of some 36,000 square miles, is a grass-covered desert in disguise. Beneath the grass lies the largest sand dune area in the western hemisphere. UNL, UNMC and Lincoln Public Schools are partners in a five-year, $5 million project to empower parents to become more actively engaged in their children's learning and success. Susan J. Rosowski and Alan Kamil received the 2004 Outstanding Research and Creative Activity Awards, given in February by the University of Nebraska's central administration. The ORCA recognizes faculty members for research and creative activity of national or international significance. A documentary film by two students of the UNL College of Journalism and Mass Communications received the bronze medal in the documentary category at the Academy of Motion Picture Arts and Sciences' 31st annual Student Academy Awards competition. UNL senior Juanita Page won her second consecutive national championship in April at the American Forensic Association National Individual Events Tournament. J.D. Edwards Honors Program students made the news this year when they developed software to track the movements of the nation's 96 million cattle. The software piqued the interest of USDA officials, who are looking for ways to monitor cattle to track disease and assure trade partners that U.S. beef is safe. Two second-year students in the University of Nebraska College of Law won the American Bar Association's National Client Counseling Competition last spring. The UNL student chapter of the American Institute of Architects has been awarded the national chapter of the year award, which signifies the chapter as the best of 130 chapters nationwide for its membership participation in professional programs, community service and all-around participation in the activities of the organization. The awards were determined by an independent panel of architects reviewing submissions presented by the various chapters across the country. A joint program giving students a combination of skills in food science, nutrition and culinary artistry graduated its first student last year. UNL moved up four places in the National Universities-Doctoral category in the 2004 edition of U.S. News and World Reports Americas Best Colleges issue. UNL was 52nd in the nation among national public doctoral universities and 107th among all national doctoral universities, including private schools. The last year brought a new president to the University of Nebraska, a new senior vice chancellor to UNL and several other important new faces in leadership roles.